1) Does your organization conduct regular performance reviews? The first survey question yielded results consistent with the trend that the perceived value of performance reviews is diminishing, and highlights performance management oversight within the industry. While 60% of respondents answered in the affirmative this is far below the national average of 91% as of 2017, according to a 2018 WorldatWork Survey. The effectiveness of these performance reviews is examined in the results from the second survey question. 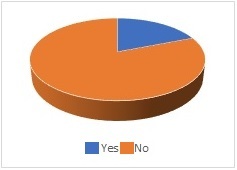 This disconnect is further exposed by the results that 22% of respondents answered “no” and 17% of respondents answered “I don’t know” to regular performance reviews. We can reasonably surmise that a majority of the “I don’t know” respondents’ companies do not conduct performance reviews because the process does require individual participation. Therefore, approximately 40% of the respondents are a part of organizations that do not conduct regular performance reviews. This reveals that nearly half of all businesses within the industry are not measuring and prioritizing their employees’ development and growth. 2) On a scale of 1-5 stars, how effective do you find performance reviews? The second question was a follow up to those respondents whom affirmed their organization conducts regular performance reviews. The 2.67 average rating of performance review effectiveness further acknowledges a flat perception of the performance review process. Although this statistic does not inform on satisfaction with the process, statistics from CEB state 95% of managers are dissatisfied with the way their companies conduct performance reviews. Couple this with the fact that nearly 90% believe the process doesn’t yield valuable information and it is evident that the performance management process is ineffective. The traditional performance review process is one with origins that date back decades, given that it has not been adapted to the 21st century the ineffectiveness is expected. The handful of organizations that have attempted to modernize performance management are the focus of our remaining survey questions. 3) Do you or your organization currently utilize a performance management system? Approximately 81% of respondents at IBS 2019 stated that they or their organizations do not currently utilize a performance management system. Our survey results have shown the building industry to be well below the national average regarding performance reviews, and that carries over into the use of performance management systems. According to “A Survey of Workplace Health Priorities” by Virgin Pulse, 53% of organizations report that they do not actively track improved performance. For the more than 80% of organizations that do not currently utilize a performance management system, a recent Gallup survey yielded results that the majority (51.9%) of workers in the U.S. are considered “not engaged” in their jobs. There is a clear contrast that the management teams of businesses are disconnected with their employees and the building industry is no exception. 4) If you or your organization are utilizing a Performance Management System, which one is it? Within the 19% of respondents that affirmed they or their organization utilize a performance management system, additional insight reveals the true percentage to be lower. A significant majority could not recall the system’s name or were not aware of the performance management system their organization is utilizing. In addition, some respondents answered believing that other systems, such as Customer Relationship Management (CRM), was a performance management system being utilized by their organization. Once removing those respondents that either did not know the name of the system being utilized or named a platform with primary functions outside of performance management, the percentage utilizing a performance management system was less than 13% of all respondents. The fact that nearly 90% of all respondents or their organizations do not utilize performance management systems constitutes further that performance management as almost nonexistent within the building industry. A closing argument to this narrative was provided by the results of our final survey question. 5) If you or your organization are utilizing a Performance Management System – How effective do you find it? The overall effectiveness of performance management systems in use by respondents or their organizations was 1.75 out of a 5, just over a 30% rating for effectiveness. Given that the answers to which performance manage systems were being utilized in the previous survey question lacked confidence, the 1.75 Average Rating of system effectiveness is expected. It is also expected when viewing from the standpoint that performance management statistics within the building industry are well below national survey results. The Business Times cites Adobe and Deloitte as examples of forward-looking businesses, those on the opposite end of the spectrum for national performance management data. Case studies of these businesses concluded that 66% of company leaders were enabled to develop their employees through data that their performance management processes yielded. Deloitte found that 75% affirmed the increased check-ins between supervisor and employee were a valuable use of time. We can see that prominent, global businesses are investing their resources towards modernizing their performance management processes and the positive impacts are being felt. Yet the few organizations that have attempted to utilize performance management systems within the building industry are still considerably behind national averages and have not been able to successfully integrate effective performance management within their companies. With the 2019 NAHB International Builders’ Show gathering 100,000 like-minded individuals the Performance Scoring Performance Management Survey provided context to the unknown landscape of performance management within the industry. Our results for each question all lead to the summation and conclusion that performance management in the industry is grossly ineffective and lagging behind national trends. We hope to continue the discussion with respondents and their organizations to dive deeper into the root causes for this wide-spread neglect of employee, vendor and company performance development. As automation continues to become commonplace within the industry, competition will be predicated on increased awareness and focused action on maximizing individual employee and vendor value. Employee engagement, continuous feedback and high-performance coaching – all critical aspects of effective performance management – have proven that they correlate with increased productivity and profitability. As the building industry continues its success and expansion, the workforce takeover by the millennial generation looms. Will the construction industry become forward-thinking in terms of performance, or will it continue to neglect its human capital? Only future data will tell.